Dunleavy will remain on as general manager. And the owner remains the same. 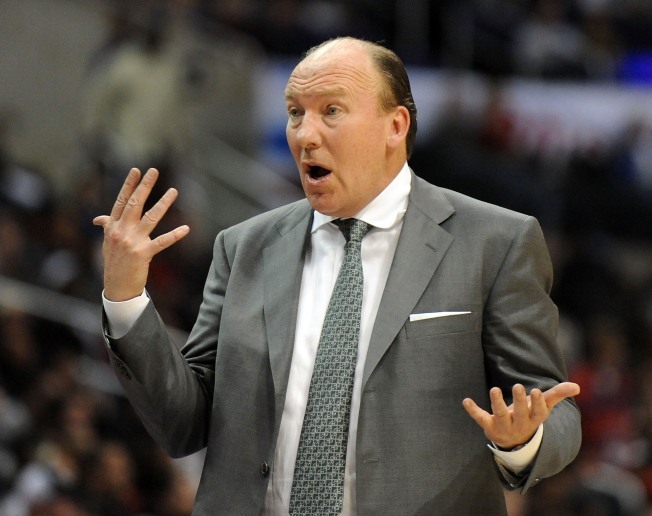 Mike Dunleavy is out as Clippers head coach. The move itself was not a surprise but the timing was — Mike Dunleavy has stepped aside as the Clippers coach. Dunleavy will stay on as general manager — you didn’t expect owner Donald Sterling to actually eat the $5.5 million he still owes Dunleavy, did you? — and assistant coach Kim Hughes will take over as interim head coach through the end of the season. After Sterling shelled out money for Baron Davis last year only to see his new star and coach feud (Davis is a free spirit and wants to run, Dunleavy likes it slow and controlled) and the team play uninspired basketball, there were rumors that Sterling seriously considered letting Dunleavy go last summer. But, because he’s always about the money first, Sterling kept Dunleavy on rather than buy him out. Dunleavy signed an extension after his 47-win season of 2006, but has won 40, 23 and 19 games in the next three years. That extension runs through the end of next season. With top draft pick Blake Griffin in the fold, there were high expectations for the Clippers going into this season — like making the playoffs in a deep Western Conference high. But then Griffin went down and the Clippers started off 0-4. And the rumors started up again that Dunleavy would be out. There have been spurts of good play, but for the most part this year’s Clippers have been unimpressive. And they lost six of eight on the last road trip, including to four-win New Jersey. Dunleavy was always ready with the excuse that he has yet to have a healthy team — Griffin was out this year, Davis, Eric Gordon, Marcus Camby and Chris Kaman have all missed time. He’s right about that. But Houston has never had Yao Ming or Tracy McGrady this season and they have a team full or role players 5.5 games ahead of the Clippers. Portland has lost every decent center on the roster and has had Brandon Roy miss games and they are six games ahead of the Clippers. Those teams have played with passion despite the injuries, the Clippers often just seem to go through the motion. Besides, it was Dunleavy the general manager that brought in the injury prone Davis and Camby. Hughes is not likely to turn this roster around in an instant. But this move signals that Donald Sterling wants to see some return when he invests in the team by bringing in free agents, that he wants to see a team where the coach and players are on the same page -- Where the team scraps for wins. But of course, for Sterling the money still comes first, so Dunleavy will be in the front office. Picking the new coach.